Are you a fun date? Or did that fun stop when you got married? For many couples, once they get married the dates end. More often then not it's because money gets tight! For the past 15 months, Jimmy and I have made a commitment to go on a date together at least once a week even if it's just doing something for free. As hard as it is sometimes to come up with something living in a small town, we have finally compiled a nice little list of things we like to do together. I LOVE our date nights! They have been one of the best things we have done for our marriage. It's nice to know that in the middle of the week, when we've been running around doing everything else under the sun, that I get my hubby all to myself for a whole evening! 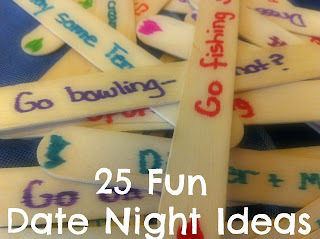 So if you are a dating couple, newlywed, or an old married couple, here is a list of 25 things you can do with your spouse to spend time together on a date night! 1. Go on a picnic 2. Go out for a country drive...pack snacks and a favorite CD 3. Go ice-skating 4. Go mini golfing 5. Go out in the middle of no where and star gaze 6. Go fishing 7. Go bowling 8. Make dinner together...and eat it together! 9. Go flea marketing;) 10. Go on a hike 11. Order pizza and play a board game 12. Rent a movie and watch it on a laptop somewhere outside...make your own drive in! 13. Play tennis 14. Go spotlighting 15. Make a time capsule to open in 10 years...get creative! 16. Go to a coffee shop...just sit, drink, and talk 17. Dress up nice and go out for dinner 18. Camp out...build a bonfire and sleep under the stars 19. Go on a bike ride...bonus if it's by a river or lake;) 20. Go to the gym together and workout 21. Go to a minor league baseball game (or any other sport you enjoy) 22. Pick a TV show and have a marathon (We just started watching Jericho on Netflix...it's addicting!) 23. Go play arcade games together. Embrace your inner kid;) 24. Go out for ice cream and take a walk around town 25. Go treasure hunting! Ever heard of Geocaching? It can make for a very fun and adventurous date night, and the best part is, it's free! Even with a nice little list of date night ideas, do you and your hubby ever find yourselves clueless as to what to do? No one wants to decide....hmmm. 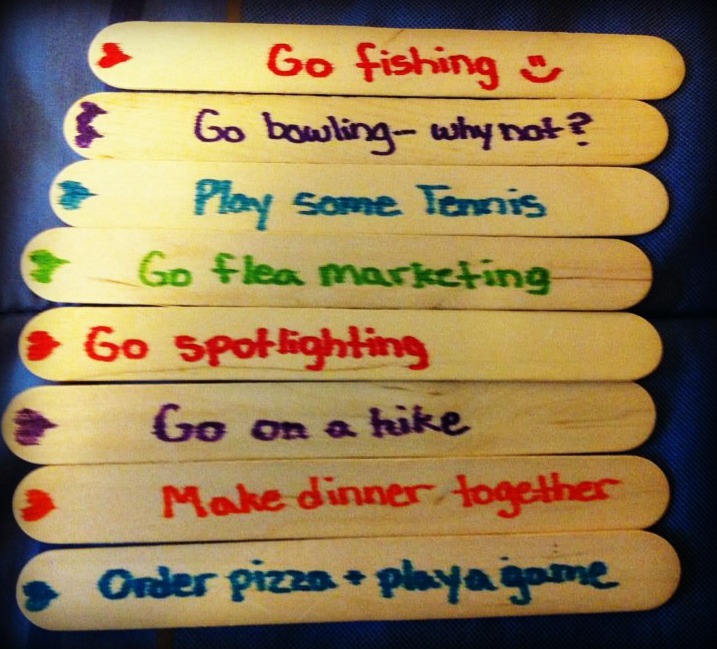 Well to avoid that horribleness, I wrote out all our ideas on Popsicle sticks and we take turns drawing one every week. You can lay them out face down, or stick them in a jar and draw! Here are a few of our favorites. Thanks for these - might have to copy a few! Life feels like it has been so stinkin busy lately I don't know when I went on a date with my husband last...This idea is definitely a MUST! This is SO cute! Number 7 - Go Bowling made me chuckle because for years before we were married we went bowling every Monday night at 9pm...even after all that time we were both still crummy, but it was so much fun we didn't care! I'm going to be passing my Liebster award onto you! Check out my blog for details! Seriously, we do actually like to bowl together. Thanks for a great list! Wow Faith these are great ideas! Thanks for sharing, and way to go on keeping the romance alive! You won't regret it once the baby gets here! what a rockin' list -- i did a whole month on mason jar picnic ideas while my husband was away for the month - time to draw some inspiration and had back to it! :) i love the hiking one too -- can't wait for the kids to be a BIT older!! I saw an idea like this on Pinterest and wanted to make for my hubby and me. You've reminded me of it and I hope to make a "date jar" soon. Great ideas! Great ideas! My hubby and I need to do some of these on our monthly date night (I have a baby and a toddler so hopefully one day it will be more than once a month). Our dinner and a movie can get a little stale! Honestly.. I think this is such a cute idea!!!!! This is super cute! My parents do something like this every two weeks, and I'm stuck at home baby sitting. I saw the meteor shower last night and it was amazing! We got home at like, 3 AM. Time well spent. New Follower, would love the follow back! VERY cute idea!! These are all great date nights! Great list, I am saving this. :) We usually do the dinner and a movie thing, or rent movies and order in. It's fun but we should try switching it up sometime! Those are so many great ideas! I'm pinning! Love this!! I so need to try this ASAP. We need a date night soon, it's been three months since Grace was born! Thanks for posting this idea. I used your popsicle stick picture and linked back here on my post today. I just found the picture through google image search so I was pleased to follow the link and find your blog. 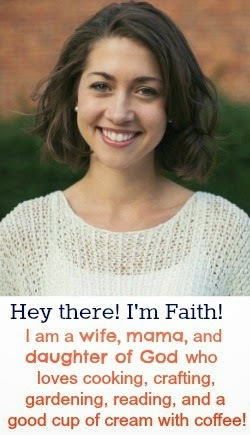 I'm getting married next year and am also a Jesus-lover, so I'm glad to make a friend in a similar step of life.